MANILA, Philippines (UPDATED 7:48 p.m.) — The Philippines Institute of Volcanology and Seismology (Phivolcs) on Sunday morning reported a magnitude 5.9 earthquake in Surigao del Norte. According to Phivolcs, the magnitude 5.9 quake which occurred 8:08 a.m. is an aftershock of the powerful magnitude 6.7 tremor that jolted Surigao del Norte last February 10. The quake’s epicenter was located 6 kilometers south 66° W of San Francisco (Anao-aon), Surigao Del Norte. It has a depth of focus of 13 kilometers. In its 8:37 a.m. advisory, Phivolcs said the quake was felt at Intensity VI in Surigao City while Limasawa and San Ricardo Souther Leyte felt the tremor at Intensity IV. On the other hand, San Juan and San Francisco, Southern Leyte felt the quake at Intensity III and General Luna, Surigao del Norte felt it at Intensity II. 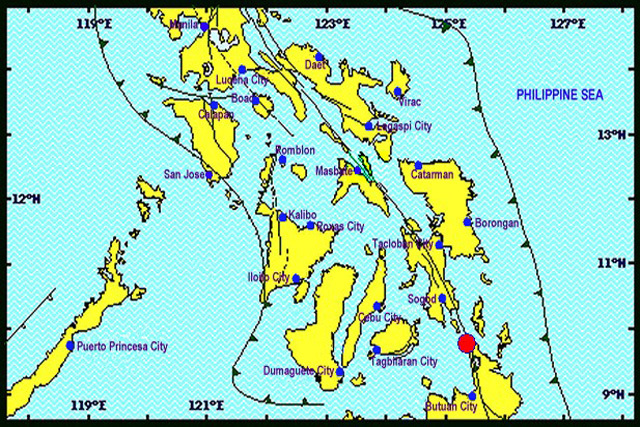 Borongan, Eastern Samar and Palo, Leyte reportedly experienced the quake at Intensity III. Phivolcs categorized the magnitude 5.9 aftershock as very strong where limited rockfalls and rolling boulders may occur and trees were noticeably shaken. Aside from the magnitude 5.9 aftershock, two other quakes shook Surigao del Norte. These were a magnitude 2.6 quake traced in Del Carmen, Surigao del Norte and a magnitude 3 in Basilisa, Rizal, Surigao del Norte. The two quakes were felt at Intensity IV and Intensity III, respectively. These are categorized as moderately strong and weak. All quakes recorded are tectonic in origin. According to local radio reports, as of 7 p.m. at least one was reported dead while 27 people were injured by falling objects from the aftershock. The unidentified fatality was an elderly woman who reportedly died of heart attack after the tremor. The 6.7-magnitude quake near the city of Surigao on Mindanao island damaged buildings and cut power to many areas. Residents rushed to open areas and spent the night in parks, local reports said. There was no tsunami threat from the quake, the US Pacific Tsunami Warning Center said. The quake took place at a depth of about 10km (6 miles) about 13km east of Surigao, the US Geological Survey said. 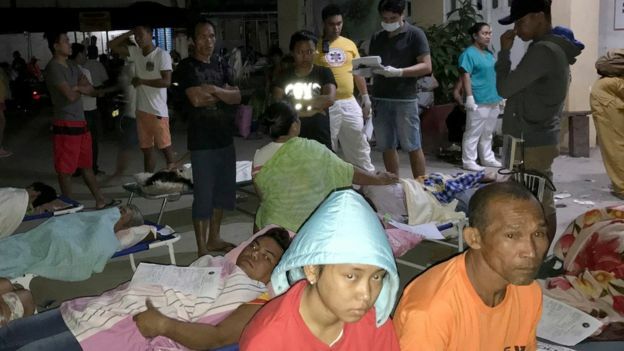 The victims died after being hit by falling debris and concrete walls, provincial disaster-response official Gilbert Gonzales said. 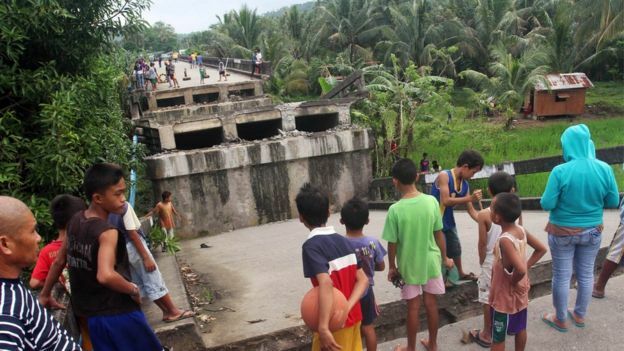 A bridge and a hotel collapsed, power and water supplies were cut in some areas and Surigao’s airport was also temporarily closed because of deep cracks on the runway, officials said. About 90 aftershocks had been recorded and more could follow but they were unlikely to cause significant damage, the Philippines’ seismic agency head Renato Solidum told local radio. Previous Post MERRY CHRISTMAS TO ONE and ALL! !